The director of Des Moines Water Works says pollutants from farm fields still pose a threat to drinking water in the capital city, but the utility hasn’t had to use its nitrate removal facility at all this year. In 2015, the Des Moines Water Works ran its nitrate removal facility for a record 177 days. 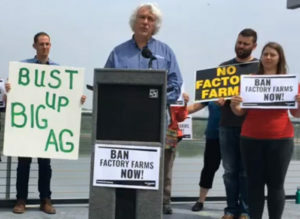 Bill Stowe says the change between then and now isn’t because of better conservation on Iowa farms. “Certainly our view is that the reason that we’re not denitrifying does not have to do with better land practices up river,” Stowe says. University of Iowa researcher Chris Jones echoes Stowe’s assessment. “The Des Moines Water Works has never been a good metric by which we should measure Iowa water quality,” Jones says. Stowe says staffers have gotten better at treating water in other ways, and that nitrates – largely from farm fields – still pose a threat. “There are problems in our industrial agricultural system that continue to leach out into our surface waters that should not have us doing a victory lap because we haven’t run the denitrification units this year,” Stowe said. The utility relies on a number of different water sources depending on demand and nitrate level.